An ice pack wrapped up with your liquid yeast to help extend the time that the yeast stays cool in transit. Cool temps help keep the viability of the yeast higher which in turns leads to faster fermentation start times and better beer. For an even better solution consider our insulated mailer with 2 ice packs. I work long hours and it gets hot where packages are left at my front door. It is cool. GET IT? Cause itâ€™s hot in Arkansas. Why risk spoiling the yeast? Keep the London Ale III cool. Coming via USPS. need to keep it cooled. I live far away and donâ€™t want my yeast to die. Received shipment less then 48 hrs . l ordered during a nor-cal winter, so even though temps not perfect and ice packet was room temp, they stayed conducive to plan for a mixed-fermentation. Bugs will Be inoculated in a 15gal single vessel solera project with a blond ale on 3.5 oz French oak with lacto, Brux trios, and Brett-C. Hoping for stone and tropical fruit easters with oak on back palate, with minimal Brett funk finishing. Cheers! Always better safe than sorry. Don't take chances with your liquid yeast. Cheap insurance. The ice packets were awesome. Better than the fish store even. Helped my yeast arrive nice and cool. Bad for yeast, great for my samich!!! I ordered malolatic bacteria during a warm spell so I purchased an ice pack in hopes the package will stay at least somewhat cool during transportation. Unfortunately when I received the package the ice pack was melted and warm. I hope it was cool enough during the trip to offer some protection. On the plus side. I now use the ice pack to keep my samiches cold in my lunch box for work. The ice pack was completely melted by the time I got the yeast in the mail. Hoping the yeast will still work. Better packaging that helps it stay cool would help. An ice pack is nothing fancy. However, if you're ordering liquid yeast and you care about viability, you need this. Don't order liquid yeast without at least one of these. A must with with White Labs malolactic yeast,wish it would stay colder during shipping. Don't waste the dollar and packaging on this. As expected, it came melted and hot and so did the yeast. Whoever closed the (thermal) envelope in which they came left it open, not that it would have made a difference. If you leave a bag of ice inside you car it will be hot in just a few hours. Because of this and because I placed my order on the 8th and I am still waiting for the rest of my order which will arrive on the 27th, this was the first and will be the last time I buy from this store. I have to admit customer service was exceptional when I called them. Outdated yeast delivered four days after claimed delivery date. The yeast was received August 7th but was dated May 18th. The promise of delivery was for 2-3 days but took a week. Way too long for delivery to keep the yeast viable. Will use local in person purchases in the future. delivered with in 2 days arrived hot not warm or cool hot. waste of money? These are stored at 40F. So If you're shipping a yeast with a cold pack and expecting it to be cool when it arrives. Think again. Why these are not frozen baffles me. I no longer order yeast. I buy the grains and everything else online and then go to the local homebrew store to get the yeast. Hello James - Sorry for your experience. These are actually stored frozen in our warehouse, and intended to maintain the viability of yeast in an responsible ship time. Unfortunately they are not fail-proof against Mother Nature and the greenhouse effect in the back of a box truck. An essential in anything but fridge-temperature weather. Melted by the time it came to house. UPS delivered and box was opened immediately. Not for sure if it's UPS or shipper. Hi Brice - the ice pack won't ensure it arrives cold, in fact most times it will not, but it does help keep the yeast cooler for a longer period of time than if no ice pack was used. 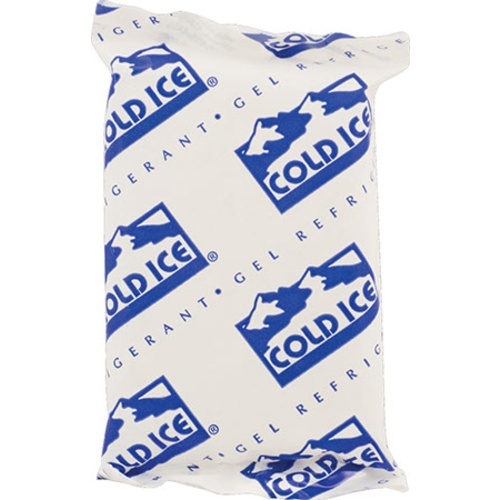 We do offer another option ICE1 which includes an insulated mailer and 2 ice packs. Again even the ICE1 won't ensure it arrives cold but it does help keep it cooler even longer. A little anemic, would order at least 2 for shipping yeast. I got m malolactic bacteria shipped in one of these. Arrived in excellent shape. Well worth the price. This ice pack is probably the best ice pack money can buy. I would like to have cases of it but can't afford that many. Every time I order yeast I will make sure I order one so I can add to my ice pack collection....I am almost positive these are made with ice dragon tears. The ice packs are probably a great idea to include with liquid yeast orders, but during the summer months, they arrived melted and just as warm as the yeast. I have now confined my purchase of liquid yeast to the winter months and order on a Monday to insure that the yeast does not sit in a warehouse over the weekend. I then harvest the yeast from my winter and early spring batches to use in my late spring - early fall batches. I have been able to use 2 or 3 liquid yeast pouches for all the batches I brew throughout the year using liquid yeast (8-12 5-gallon batches). Keeping live yeast cool in transit is not rocket science. Works like a champ! You buy yeast? You get the ice. My yeast was alive and kicking and fermented the heck out of the starter and the subsequent beer. Ice pack is reusable to keep your beers cold in the future too. With 1 day shipping it arrived warm even in an insulated pouch. Keep the yeasties happy, and cool! What can you say it's a bargain to keep the yeast cool, and a good safeguard to keep them viable. Never had a bad shipment with this . I always get my yeast with this cold pack. Made it to CT, still chilled. About 70 degrees outside. these are a must for the summer time when ordering liquid yeast, and especially for me as I live in Texas! I live in California and it was delivered still cold, ice was still In the packs. Awesome and never will I buy yeast with out these. I use this anytime I need to ship yeast and by time it arrives, the ice packs are usually thawed out. If I didn't use them, then my yeast would be exposed to those same heats with no buffer. I wasn't even thinking and bought this when I got my lacto culture, Im not sure that was necessary as lacto likes it hotter but that shows how automatic it is for me to add this to any order with a culture. Great protection for local delivery. Kept yeast viable over a two day journey. perfect for the short runs keeping your yeast viable for pitching. I live in SC and the weather is starting to get hot. I want to ensure my yeast are in a good environment during the shipping transit. These ice packs help keep a consistent temperature during shipping. I know that California gets hot early in the summer and when it comes to liquid yeast it is a good idea to protect them. Now that MoreBeer is shipping much quicker this will be even more helpful. Definitely worth the extra cost and totally reusable! I live within the 1-day super-saver-shipping zone in California. My yeast arrived still cold and the ice-packs were still cold. Can't ask for better performance than that. I don't want the ice pack if it is not being shipped with the yeast. I added 2 when buying my white labs yeast. I live in the midwest and it was in the upper 80s when the package arrived. Previous posters are right, it isn't cold when it arrives, however it was at one point... and that's much better than paying the extra shipping costs for rush delivery. I was concerned that it was too hot but I kept it in the fridge for over a week and the starter looked amazing. Still fermenting but so far appears to be quite viable. This help in the spring and fall with 70s to low 80s temperature but anything higher and this will not help. So stock up early spring and late summer as this will not help if the temperature goes into the high 80s/low 90s. This was my first time ordering yeast online. I live in Florida, so the package came 1/2 across the country. The ice package was used up and not cold by the time it reached me. This is probably no fault of anyones, but next time I will make sure to order 2 or 3 ice packs.